Manila, Philippines - The weather bureau PAGASA on Saturday, February 1, 2014 lowered the public storm warning signals in Visayas and Mindanao as Bagyong 'Basyang' weakened into a Tropical Depression while approaching Northern Palawan. In the weather bulletin released 11a.m. today, the location of eye/center of Tropical Depression “BASYANG” was estimated based on all available data at 339 km Northeast of Puerto Princesa City or at 152 km Southeast of Coron, Palawan (11.3°N, 121.4°E). 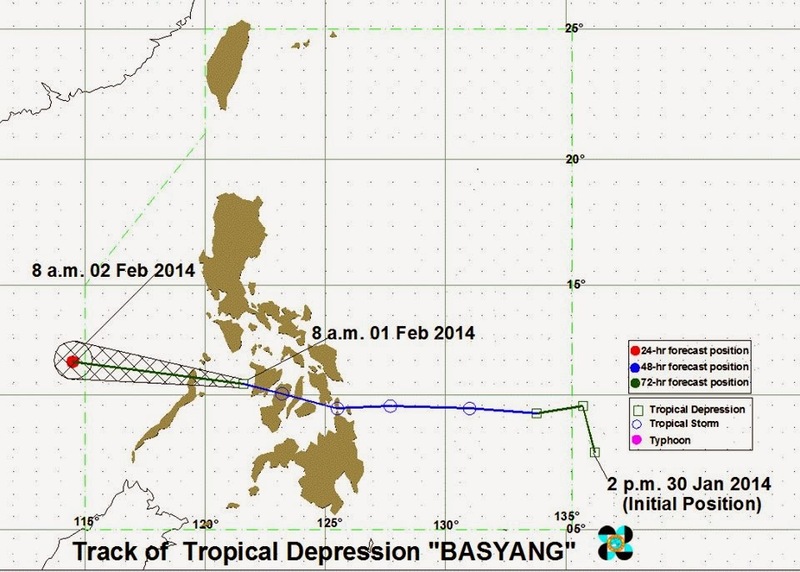 Bagyong 'Basyang' has a maximum winds of 55 kph near the center. Tropical Depression “BASYANG” is expected to be at 521 km Northwest of Puerto Princesa City by tomorrow morning or outside the Philippine Area of Responsibility (PAR) as it exits to the West Philippine Sea. Public Storm warning signal (Winds of 30-60 kph is expected within the next 36 hours) - Romblon, Palawan incl. Calamian Group of Islands, southern part of Oriental Mindoro, Southern part of Occidental Mindoro, Negros Occidental, Guimaras, Aklan, Capiz, Antique and Iloilo. Residents living in low lying and mountainous areas under public storm warning signal #1 are alerted against possible flashfloods and landslides. The estimated rainfall amount is from 5 – 10 mm per hour (moderate - heavy) within the 300 km diameter of the Tropical Depression. Fishing boats and other small seacrafts are advised not to venture out into the eastern seaboard of Central Luzon, eastern seaboard and southern seaboards of Southern Luzon and eastern seaboard of Visayas due to the surge of Northeast Monsoon.